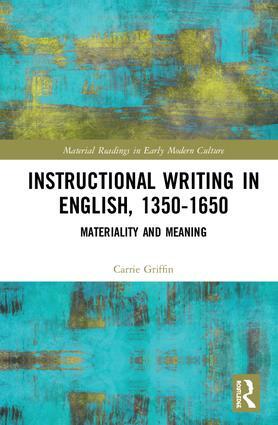 Exploring the nature of utilitarian texts in English transmitted from the later Middle Ages to c. 1650, this volume considers textual and material strategies for the presentation and organisation of written knowledge and information during the period. In particular, it investigates the relationship between genre and material form in Anglophone written knowledge and information, with specific reference to that which is usually classified as practical or 'utilitarian'. Carrie Griffin examines textual and material evidence to argue for the disentangling of hitherto mixed genres and forms, and the creation of 'new' texts, as unexplored effects of the arrival of the printing press in the late fifteenth century. Griffin interrogates the texts at the level of generic markers, frameworks and structures, and studies transmission and dissemination in print, the nature of and attitudes to printed books, and the audiences they reached, in order to determine shifting attitudes to books and texts. Learning and Information from Manuscript to Print makes a significant contribution to the study of so-called non-literary textual genres and their transmission, circulation and reception in manuscript and in early modern printed books. Carrie Griffin is Lecturer in English at the University of Limerick, Ireland.